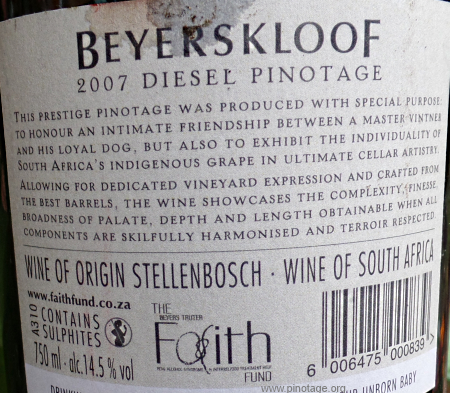 My Wine of the Month for August 2016 is Beyerskloof ‘Diesel’ 2007. 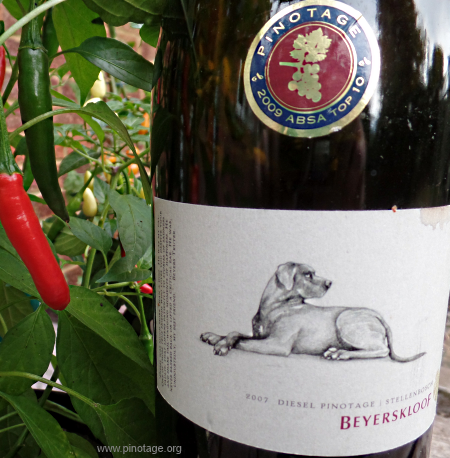 Diesel, named in memory of owner Beyers Truter’s faithful hound, is Beyerskloof’s premier Pinotage. It’s a selection of the best barrels of bush vine Reserve Pinotage. The 2007 spent four days in open fermenters with the cap being punched down by hand. Fermentation temperature was between 26 and 28°C. After malolactic fermentation in stainless steel the wine was matured in 100% new French oak barrels for 23 months. The winery says it will reach perfection ‘in 15 – 20 years’. But I couldn’t wait, and thankfully it’s hard to believe it could get any better because this was Pinotage perfection at nine years. I’ve enjoyed several Diesels over the years, mostly in South Africa and much younger since the large heavy bottle is difficult to carry home. It’s a big wine when young. This 2007 had soft tannins under sophisticated subtle silky Pinotage fruit with depths. Age had turned it into a ballerina, dancing on the tongue as it revealed more and more layers of flavours. And all too soon it was an empty bottle…….